Neighbors | Submitted.Canfield High School art teacher Kate Antal was accepted into the 54th Trumbull Art Gallery Annual Show with her painting “Buppy,” an oil on canvas. Neighbors | Abby Slanker.Canfield High School art teacher Kate Antal was accepted into the 54th Trumbull Art Gallery Annual Show with two of her paintings. Antal’s paintings “Buppy,” and “Cape Cod, 1984” were two of the 121 works of art selected by Juror Tony Armeni from the 207 pieces submitted by 86 artists. 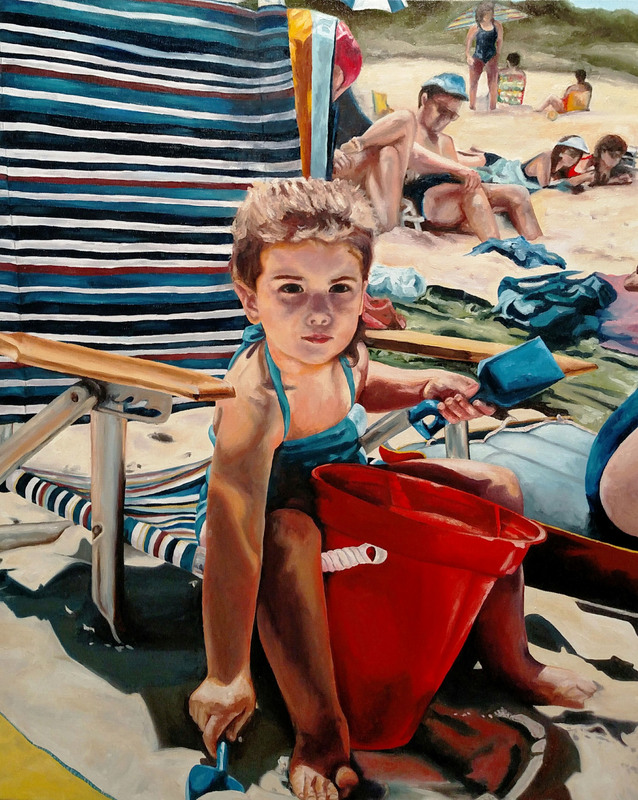 Neighbors | Submitted.Canfield High School art teacher Kate Antal was accepted into the 54th Trumbull Art Gallery Annual Show with her painting “Cape Cod, 1984” an oil on canvas. Canfield High School art teacher Kate Antal was accepted into the 54th Trumbull Art Gallery Annual Show with two of her paintings. The juried exhibition is open to artists who live within a 100-mile radius of Warren or are originally from the area. Antal’s paintings “Buppy,” an oil on canvas, and “Cape Cod, 1984” an oil on canvas, were two of the 121 works of art selected by Juror Tony Armeni from the 207 pieces submitted by 86 artists. “Buppy” was also accepted into the Butler Area Artists Show in 2017. “My painting ‘Buppy’ is of my grandfather, and if he was still living he would be so proud, as I was the apple of his eye. ‘Cape Cod, 1984’ is a painting of me on the beach when I was a little girl,” Antal said. Antal was awarded one of eight juror awards, which were presented to artists who had multiple pieces chosen for the show. Antal said it is important to her to not only be an artist and a teacher but also a teacher and an artist. “It is important for the kids to see me as an artist, not just as a teacher. It’s important for them to see my skills and what I can do. It gets them interested. I was told a long time ago it’s very important to not only be an artist and a teacher but also a teacher and an artist. That has stuck with me. If I can inspire them in class, they can see that they can do this, too. I am still learning, there is always something new to learn,” Antal said. Antal is working on her Masters in Art Education and her graduate work focuses on the interplay of memory and portraiture. “In the last five years until now, my perspective is totally different. In my graduate work, I am focusing on the interplay of memory and portraiture. I am focusing a lot on my family. I had three of my grandparents pass away in a short amount of time. This was my inspiration and motivation to go back to grad school and continue my education. For my work, I have taken pictures of objects members of my family owned and treasured and then I paint them as a tribute to my family. I also take pictures of family members and paint them as a remembrance,” Antal said. Antal said art is her passion and teaching is her passion. “Art is my passion. I love that gift I have been given. Teaching is also my passion. I love it. I love to be able to show my students what I can do and inspire them and pass my passion along to them,” Antal said. The submitted works of art which were not chosen for the Trumbull Art Gallery Annual Show will be shown at the Nissen Gallery at Trumbull Regional Medical Center, including Antal’s “Blue 33,” a colored pencil on matte board. Antal is a 2000 graduate of Canfield High School and has been teaching art at the school for 10 years. She completed her undergraduate work at Youngstown State University and will graduate in December with a Masters in Art Education from YSU. Antal will host her Graduate Exhibition which will feature he works of the interplay of memory and portraiture Dec. 10-14 at Soloman Gallery in Bliss Hall at YSU. An exhibition reception will take place from 6-8 p.m. Dec. 14, which is open to the public. August 31, 2009 12:10 a.m.